The T-4 transmitter features user friendly lights and audible sounds to let you know that the transmitter is working properly and when there is a problem with the signal field.When the T-4 transmitter is set in the encoded mode, an ID code makes the system immune to interference from stray signals and provides “DUAL ZONES”, in the signal field. The dual zone establishes two signal fields. In the first signal field the pet receives a warning level stimulus that has been preset on the front of the T-4 transmitter. Its purpose is to warn the pet to turn back. 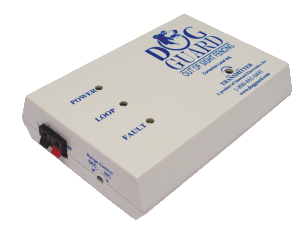 Should the pet enter the second signal field, the receiver will automatically increase to a stronger stimulus.The T-4 transmitter has two frequency settings to accommodate side by side installations and can be used on any size yard up to 50 acres.The T-4 transmitter has a LIFE TIME warranty provided it is not damaged or abused and is installed with a surge protector approved by Dog Guard. 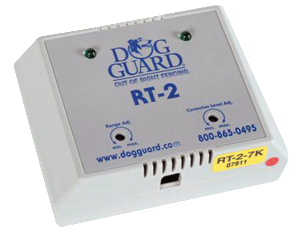 The RT-2 room transmitter is a small versatile device that is designed for containing or restraining pets in or from designated areas inside of the home. It can be used anywhere inside the home, garage or basement. The RT-2 transmitter is portable and can travel with you and your pet.The AC Adapter has a 10-foot long cord, so it should accommodate most outlet configurations in the home.The RT-2 room transmitter radiates a 360 degree signal up to 6 feet.The RT-2 room transmitter is available in two frequencies and provides both non-encoded or encoded mode settings.